Your company in the last quarter of 2013 told us that by the end of the first quarter of 2014 that it will deliver a new customs examination bay as well as a new administrative building. We are on the last day of the first quarter of 2014, have you delivered on that promise? If not, what is keeping the promise? Two things you talked about, one is the new revolutionary multi-level racking customs examination facility that we are building and the other is the admin building. They are separate projects and they have separate delivery time. For the administrative building, the delivery time is the third quarter of 2014. So it is still very much on course and certainly, it is going to be delivered at the expected time. And it is a physical project. If you go inside the port, go into our facility, you will see a huge construction work going on close to the old customs examination bay. So, we are still going to deliver by the end of the third quarter of this year. The other project you talked about, the new physical examination facility, let me, you should be the one to hear first that that facility which was being constructed in China at the cost of ten million dollars has been completed, it has arrived Nigeria as we promised. We promised that it will be here during the first quarter of 2014, we said that since last year and true to our words, the facility has arrived and that goes to show you that APM Terminal is a very serious company. APM Terminal is a company that sticks by its words, APM Terminal the one that run on adequate planning and forecasting. We are a data driven organization, we don’t just talk for the sake of talking, we talk based on facts and statistics. So, the facility is here, fabrication, construction has been completed, it has been delivered here, it is in Apapa as we speak, it is being coupled. It is a huge facility, it is revolutionary. I keep using that word. Why I said it is revolutionary is because in the whole world, it is the first of its kind, it has not been seen anywhere. It is not like APMT saw it anywhere and decided to replicate it. It was conceptualized here, designed and developed here solely for our operations in Apapa so as to meet the demand for physical examination, to provide a very decent area of physical examination for customs officers and agents and all the rest of the agencies that will be involved in Physical examination and to help facilitate the process. That was why we made an investment of about 1.3 billion dollars all to help improve the process at the port. It will help save cost, it will also help make the process more decent and faster for all. And I want to believe it is a facility that the customs Is going to enjoy using. I also believe sincerely that just as others have always copied APMT, people will also try to copy this one and we are not against that if it will add value, that will be fine. But on our part, we have made the necessary investment to acquire this. Let me give you another good news, you remember that physical examination site that used to be muddy and waterlogged, the old one before we relocated? It has been paved and this was what we told people last year, look, construction work was ongoing, people should be patient and see when we finish. We have not even finished but already people are beginning to see that look, this is a very serious issue. Nigeria is a very serious market, APM Terminal takes its operation anywhere in the world very seriously. It doesn’t matter where that operation is situated. It could be in Africa, it could be in America, it could be in Europe, it could be in Asia, it could be in Australia, we take it serious. The standard is the same. APMT facility in Nigeria is as good as APMT facility in Europe, in America, anywhere in the world and I have personally gone to all these facilities. So, the standard is the same, it is the same company, the same management, it is the same philosophy, it is the same vision and the same mission of adding value and lifting global trade in any environment that the company finds itself. If I should take you by your words that this project has been delivered, how come it is only APMT that seems to know about it? It has arrived as I told you. It is ours until we call you to come and see, right? It is going to be commissioned in April, then we will call you to come and see if you are waiting for the come and see. We have not started using it. Like I told you, it is being coupled. When you bring such gigantic facility, you will ensure you couple it properly, the experts are there, that place that you said you saw that has been paved, that is the examination site and that is where the facility is going to be. But I was at the site last Friday, no doubt, work was ongoing on the new administrative building. Aside the paved area, there was no visible coupling work going on at the site as the time of my visit as regards the customs examination bay? Don’t worry, you will see it. There is nothing to hurry about. You will see it. Luckily, you have seen that the place is paved; there is a reason why it was paved. So you will see the reason very soon and I am happy that you have seen it by yourself, you will see, don’t worry. See, there is nothing like attribute to and I want to again ask my colleagues to step out of the sphere of the blame game. The whole idea of looking at what is wrong, why not look at what is right? Well, I am not aware of any congestion at the port. Our terminal is certainly not congested. We have capacity now for one million TEUs. What is the total container throughput in Nigeria last year? It is not even up to a million but at APM Terminal alone, we can conveniently handle one million Twenty Equivalent Units of containers. So where can the congestion be? Maybe you should go and check the cargo throughput for last year even in the whole of Lagos, then divide that by two and see if what you get can fill up a facility that can take up to one million. So where is the congestion? But let me also say this so that you don’t think one is misinforming you. There are challenges associated with clearing. It has nothing to do with APM Terminal. But I am not competent to talk about that. Don’t forget we have nothing to do with clearing, ours is to discharge, get it ready for examination and deliver. In that area of clearing, since the introduction of the Pre-Arrival Assessment Report (the PAAR) on honest declaration by importers, that is the basis of PAAR. But you and I know that honest declaration by importers is a rare commodity and I am not just saying this, I mean the likes of Dr. Aniebonam has said this, even the customs high command had said this. So, when you have a platform that was configured to thrive on honest declaration and that honest declaration is not forth coming, you are plugging the system. I think we should now begin to direct our attention, our information and education towards importers and agents. There is the need to embrace honest declaration as much as possible if they want the Pre-Arrival Assessment Report to work. They should, if they don’t, the more they don’t declare honestly, the slower the PAAR will run and the slower the PAAR runs, the slower the rate of clearing goods at the ports. Now that you have mentioned PAAR, do you think the agents and importers as solely responsible for the slow rate of progress made so far by PAAR? I am not blaming anybody. I have only re-echoed what the leaders in the industry have said. 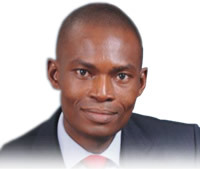 Dr. Boniface Aniebonam is not just anybody in the Maritime industry. I am speaking right now as APM Terminal, I mean it is not my business to blame anybody for whatever is wrong in the system. But, you see, it is also important we make it clear that people should make honest and genuine declarations. I honestly do not see what the customs is doing wrong here and that is my sincere opinion. I think we should even commend the Nigeria Customs Service for developing this home grown technology to develop the clearing process at the ports, afterall when the Service Providers were handling the Destination Inspection Scheme, Austin you and others were the ones crying foul, foreign companies are taking all our monies and everybody was in the forefront of asking the government to hand over to the customs and the customs took over, very well and customs developed a special platform and software for clearing, now if some people are deliberately sabotaging that platform, I think we also owe it as a responsibility to assist customs to make it work by also telling those who are not doing the right thing to have a rethink for the sake of our port industry, to have a rethink for the sake of the Nigerian economy because whatever happened in the ports will eventually translate to the larger society. I am sure you are aware of the constant server breakdown and I am also sure you aware of the inability of the Mobile scanner to function properly thus delaying clearing. Are you that these things are not part of the factors militating against the success of PAAR? Well, I am not competent to speak on that. I think the experts in customs clearing will be in a better position to provide answers to the question. Agents and importers have it that your terminal resumes operations at 10. Am and closes at 3.Pm. They also alleged that most times, you work only for four hours in a day out of the usual twenty-four hours thus slowing down the clearing process. How do you react to this? All those are wrong information. APM Terminal runs 24/7 operation. Our terminal never closes; our workers are on three shifts, ships coming midnight, in the daytime, there are always people receiving them. It is even in our best interest to work 24 hours. So, we work round the clock. Now, what they are probably referring to is the examination area which is just a part of our operations. Now cast you mind back to one time last year when the Minister came to Western Zone, there was a meeting and there were resolutions and what were the resolutions? What was the time for examination? So what do you want us to do when there is a document that says, start examination by this time and end at this time? So what do you want us to do? To do it beyond that time so that they can come and say we are not keeping to agreement. There is a time for examination and again let me say that maybe you should just refer to the paper so that you can answer those who are making these insinuations. There was a communiqué read by the Minister of transport that examination should between 10.am to 3.pm. But we work round the clock at the terminal. But the issue of examination, there is a special directive on it. So it that hour that is for the examination. Apart from that, let me say, we are not responsible for examination, I hope you know that? So my brother, if you are importer or agent or customs, if you are not there, can I break the container? Do you have any plan to educate the importers and agents on the responsibility of every operator in the port so as to guide to properly identify who is responsible for what? You think they don’t know? Just like you said that they were accusing that we are examining at this time, the question I asked, is there no resolution directing the time we commence examination? So why should anybody now use that to deceive other people? Thank God you were there, assuming you were not there, it would have looked like another propaganda. Apart from that, you see, problems are created elsewhere and then terminal operators are asked to come and use their heads to carry it. I don’t think this is the way to go this year, the approach needs to be changed.